Today was my last play day for awhile before I go “back to school” here in Istanbul. Tomorrow, I am starting a 4-week intensive Turkish language course at one of the local schools. The classes will run from 9 a.m. to 1 p.m. weekdays, and then I’ll have homework to do. So I decided to spend part of my day playing in my kitchen. I recently bought 1 kilogram of badem unu (almond flour) at a small market in Kadıköy. I’ve been looking for the finely ground nut flour for awhile, so I wanted to stock up. When I was working at the restaurant in Baltimore, I used to serve almond financiers as one of my petit fours at the end of the meal. A financier is a small French almond cake that tastes buttery and nutty. It’s slightly crisp on the outside while retaining its moisture on the inside. Back in culinary school, I learned that the name financier is derived from the traditional rectangular mold it’s baked in – a mold that resembles a bar of gold. Here's another batch of financiers that I decorated with pistachio buttercream. I love to eat the financiers practically fresh out of the oven. The beurre noisette flavor is just out of this world! I have my own recipe, but I decided to try a new recipe I read awhile back by French food blogger Clotilde Dusoulier. I admire her website and envy the fact that she lives in Paris. The recipe is fairly straight forward and leaves a lot of room for different improvisations. I made a double batch – half with the addition of cocoa powder and espresso and the other half plain garnished with frozen Turkish vişne (sour cherries). If you don’t have a traditional financier mold, a mini muffin tray or similar tray will work just as well. Garnish with assorted chopped nuts, chocolate chips, dried or fresh fruit. Also, you could fold in finely chopped citrus zest or candied ginger. 2. In a small saucepan, melt the butter over medium heat. Cook the butter for a few minutes until it is lightly browned and it smells nutty. Set aside. Here's what the butter should look like once melted and cooked until the "nutty" stage. 3. In a mixing bowl, combine the almond flour, flour and sugar. Add the eggs or egg whites and combine using a spatula by hand or with an electric hand mixer. 4. Then, stir in the melted butter and thoroughly combine the ingredients. 5. Coat the selected mold with a nonstick baking spray. 6. Using a pastry bag with a small rounded tip, pipe or carefully pour the batter into the molds, filling it just to the rim. 7. Garnish the top of each financier with chopped nuts or fruit, if you so desire. 8. Bake the financiers for about 8 to 10 minutes, depending on the size your molds. 9. The financiers are done when they look slightly golden and crusty on the edges. Let the tray rest for a few minutes before turning the financiers out on a rack to cool completely. I actually found this financier mold at one of my favorite baking supply stores in Eminonu. Hi Joy! These look absolutely fabulous! Good luck with the Turkish classes! 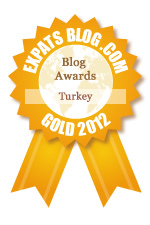 I'm sure that knowing a bit more of the language will help you to get the most out of your new life in here in Turkey.